You love your pets, which is why it’s important to keep them safe at all times. This means more than simply keeping the animals you love adequately fed and sheltered. The world is wide and it’s home to lots of other creatures—some of whom are less benign than others. If you want to make sure that your Norwich terrier is safe when playing in the back yard, take a look through this list of handy tips for keeping some of nature’s more aggressive members well away from your furry friends. One of the most important factors to consider in this regard is the way you set up your outdoor spaces. Landscaping has a huge impact on the likelihood of wildlife making its way onto your property, so you’ll want to be especially mindful of things like planting design, and do some research on which plants and objects provide the best habitats for various wild animals. We’ve done some of that work for you below. Follow these tips and make sure your lawns and yards provide friendly spaces for your pets without encouraging the wrong animals to trespass. One of the most important ways to keep unwanted wildlife off your property is to learn about plants that will act as natural deterrents, then deploy them strategically around your outdoor spaces. These will vary greatly depending on the kind of animals you’re most intent on keeping away. For instance, deer and rabbits are normally gentle but have been known to attack pets in rare circumstances. To keep them out of your garden and away from your lawn, it’s a good idea to plant any of the following: sage, rosemary, mint, dill and oregano. More aggressive animals like raccoons can be discouraged by plants with prickles or thorns, due to the sensitive skin on their feet. Good examples include oriental poppies and squash. Even plants that discourage wildlife won’t be enough if you allow your yard to grow into an attractive habitat for them. That’s why it’s critical that you keep your outdoor areas well groomed and reduce the number of areas where wild animals could move in and set up homes. The harder it is for them to live nearby, the less likely you’ll be to find them in your space. There are plenty of resources out there to put you in touch with high quality and eco-friendly landscapers who can help tailor your yards and gardens so that they’ll be safe for pets but uninteresting for pests. Different animals like to congregate in different places, so it’s important that you avoid inadvertently setting up attractions for animals you don’t want hanging around. A lot of the time, this has to do with food sources, although habitat is also a key factor. Grazing animals will typically go for your grass, so you might consider artificial grass or astroturf. Birds may be more interested in the fruit growing in your garden, so consider covering your fruit plants with garden mesh. Wire mesh underneath the surface of the earth can also deter burrowing animals such as mice, gophers, or (when it comes to more dangerous creatures) snakes. Whatever you do secure your property, remember that not all wild animals are dangerous—and while it’s certainly advisable to keep them away from your domestic animals, you may also find wild animals from time to time who need your help. 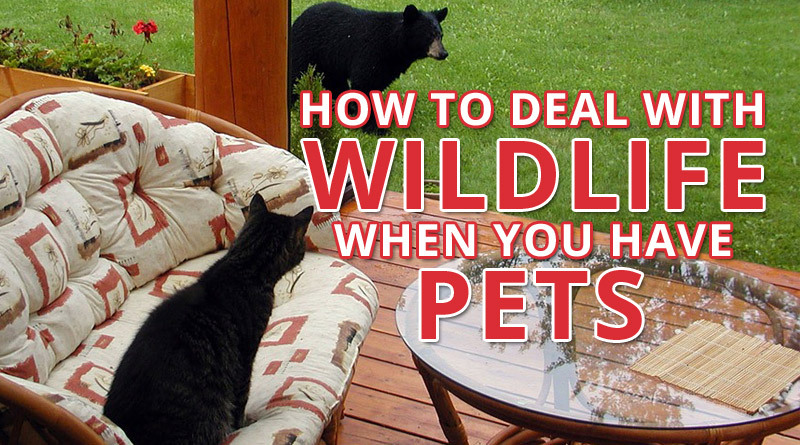 There are plenty of ways to keep wild animals you encounter safe while also protecting your pets. Just maintain a healthy respect for all the life around you, and you should be fine. Previous Previous post: How Will You Decorate Your Dream Cabin?